The WrapPanel element in XAML represents a Wrap Panel. 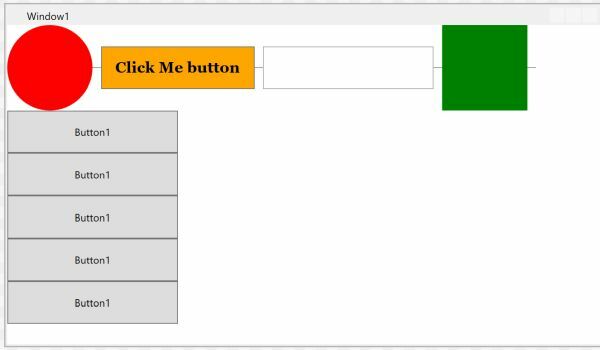 This tutorial shows how to use a XAML WrapPanel in WPF and C#. A parent control with multiple child elements may require wrapping functionality to place child elements in an order. The WrapPanel element in XAML is used to provide vertical or horizontal wrapping of child elements of the panel. The XAML WrapPanel element a wrap panel. The Orientation property is used to provide wrapping functionality of child elements. It can either be horizontally or vertically. The following code snippet sets the Orientation of a WrapPanel to Horizontal. Listing 1 is the complete code that defines a WrapPanel and sets the Orientation, ItemHeight, and ItemWidth properties of a WrapPanel in XAML. This below code will have every item of a WrapPanel have height and width 100 respectively. Note: If you do not specify ItemHeight and ItemWidth properties of a WrapPanel, the default height and width of child items within a WrapPanel will be child elements height and width. The code example in Listing 2 adds 6 child elements to a Wrap Panel. The output of Listing 2 looks the following Figure. We can also use nested Wrap panels. The code snippet in Listing 3 adds a child WrapPanel to a parent WrapPanel. The child WrapPanel has 5 Button elements stacked vertically. The output of Listing 3 looks like the following. Learn more about how to use a WrapPanel in a WPF app.